Vintage sounds in a practical package with plenty of potential for sonic creativity. Excellent recreation of the Uni-Vibe tone. Practical. Versatile. Good value for money. TC is taking its inspiration from the past with its latest pedal: the Viscous Vibe, which is designed to deliver distinctive Uni-Vibe tones. 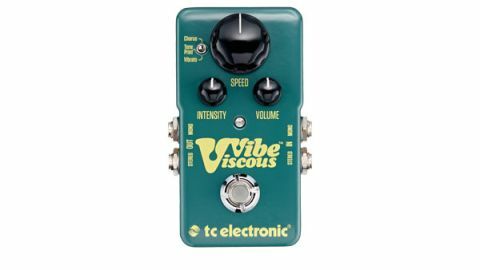 "Sound-wise, TC has got it just right with those familiar vintage Uni-Vibe tones"
It might have a sound that were originally minted in the late 60s, but this new pedal is decidedly 2015, with the modern accoutrements of true bypass, analogue dry through signal, choice of stereo or mono operation and, of course, TC's TonePrint facility. This means that you can load it with a custom-made tone, either by TC and its roster of artists, or yourself by using the TonePrint editor software. Described by TC as a 1:1 digital recreation of the legendary Shin-Ei Uni-Vibe, the Viscous Vibe offers both of the selectable options found on the original (chorus and vibrato) via a three-way switch, as well as whatever TonePrint you have loaded into it. There are small knobs to set the intensity of the effect and the output volume, but a nice touch is the large Speed knob that stands proud of the rest, allowing you to adjust it with your foot. Sound-wise, TC has got it just right with those familiar vintage Uni-Vibe tones. At the time of writing, TC had no available TonePrints for the pedal, and it wasn't recognised by the editor software, but this will no doubt be sorted shortly, opening the way to exactly tailoring the sound to suit your purposes. As long as there are Hendrix and Trower fans out there, there will be demand for Uni-Vibe tones. So, how does this stack up? Extremely well, we'd say, as it's big on the twin virtues of practicality and versatility. It's 'board- and wallet-friendly, and can nail the vintage tones, but it's the open-ended nature of the TonePrint facility that gives it an edge over its more conventional rivals. The familiar vintage-like tones are here, but you will always have a creative alternative.